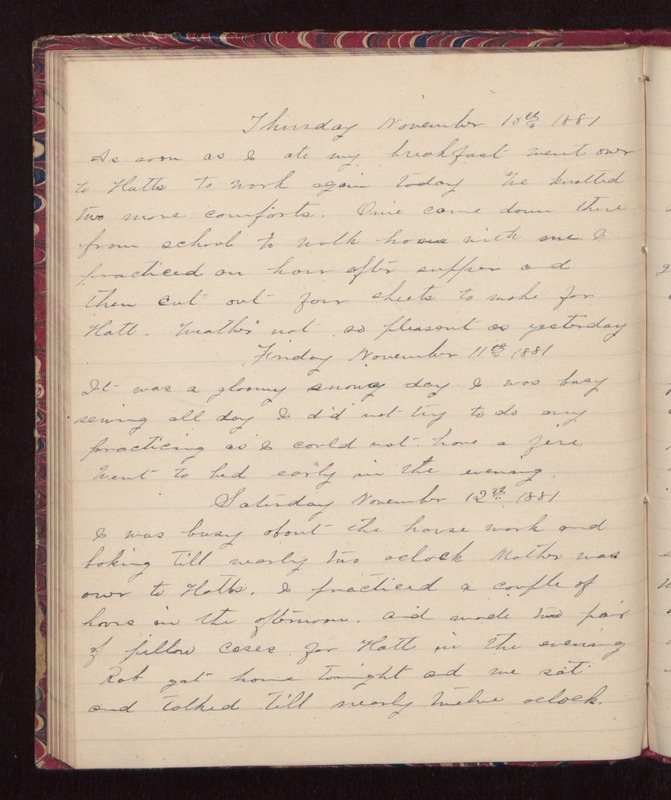 Thursday November 10th 1881 As soon as I ate my breakfast went over to Hatts to work again today. We knotted two more comforts. Orrie came down there from school to walk home with me. I practiced an hour after supper and then cut out four sheets to make for Hatt. Weather not so pleasant as yesterday Friday November 11th 1881 It was a gloomy snowy day I was busy sewing all day. I did not try to do any practicing as I could not have a fire. Went to bed early in the evening. Saturday November 12th 1881 I was busy about the house work and baking till nearly two oclock. Mother was over to Hatts. I practiced a couple of hours in the afternoon, and made two pair of pillow cases for Hatt in the evening. Rob got home tonight and we sat and talked till nearly twelve oclock.